Is Optimism a Fact of Life in Israel? Here are a few quick facts to convince anyone that life is getting better. Try this cool life expectancy tool from Google to see. People are living longer. If you are born in Israel today you’ll live ten years longer than if you were born in 1960. 20 years if your are born in Haiti. 37 years in China ! Israel is one of the countries with longest life expectancy. 81 years. even better for women. 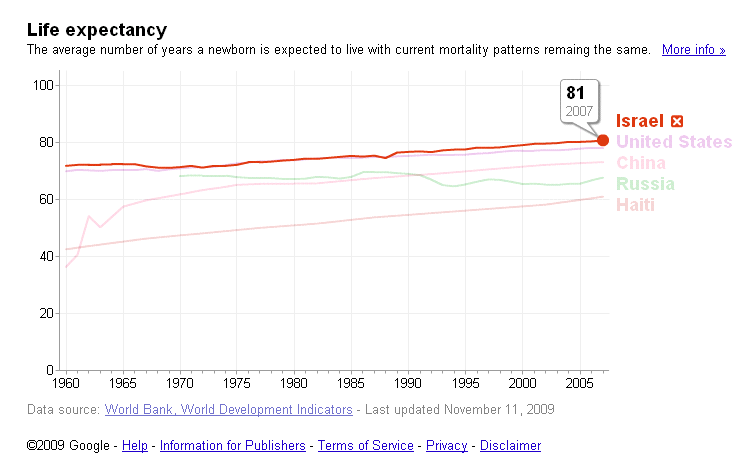 Life expectancy gaps between rich countries and poor countries are narrowing. The number of traffic accidents in Israel has decreased by 35% in the last 12 years. This entry was posted on November 15, 2009 at 10:08 pm and is filed under Perosnal. You can follow any responses to this entry through the RSS 2.0 feed. You can leave a response, or trackback from your own site.